Recently Renata Litvinova's daughter - Uliana Dobrovskaya surprised her followers by the original picture. She has shared a picture of herself posing in a bathing suit and this was not surprising, if not for the surroundings in which the shooting took place. 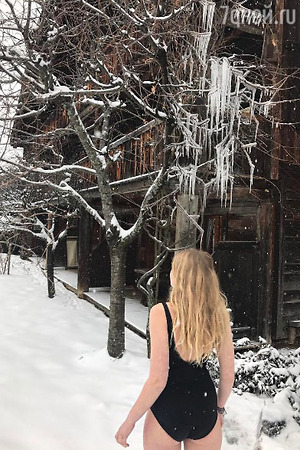 Dressed in a black swimsuit Uliana went out for a photo shoot on the street, where at the moment it was snowing, and all around was covered with snowdrifts ... Her artistic idea she explained simply, "because I'm Russian!". Apparently she hinted that, after living for many years in Russia, she is no longer afraid of any frost. Picture was taken in the Alps, where Renata with Uliana and friends went to rest a few days ago. Incidentally, the actress recently celebrated there her 50th anniversary. By the way, a similar picture has been shared on Instagram of Litvinova. However, Renata appeared on the background of snow-covered streets in her dressing gown. Incidentally, if Renata flew to France on holiday, then Uliana has recently been living there year-round. Some time ago, the actress pulled the daughter out of the Russian school and transferred her to an educational institution in Paris. According to Renata, Uliana spent all her free time studying, and she simply had no opportunity to read books and go to exhibitions. Litvinova said the school in Russia made her daughter unhappy, and therefore she carried her to France, where she acquired a luxury apartment a couple of years ago.